Organic dark chocolate and coconut sugar. Plant based. A world of good. Made with coconut cream. Gluten and dairy free. Source of fibre. Vegan. Free from dairy but not temptation Our Snowconut Sticks combine classic vanilla with the wonders of the mighty coconut. 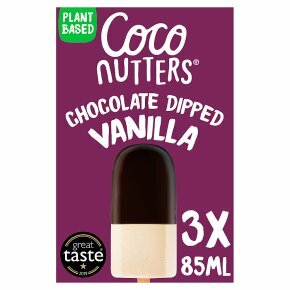 Dipped in decadent dairy free dark chocolate, they're the perfect dessert on a stick.